*Brand and other exclusions apply; see a sales associate or bergdorfgoodman.com for details. President's Circle members earn 15 bonus points for virtually every dollar spent or earn 10 bonus points on designer or precious jewelry. Earn Double InCircle® bonus points on any purchase and Triple InCircle® bonus points on fine apparel, handbags, and shoes. Items that earn Double or Triple InCircle® bonus points will be designated on the site with an indication on their product page. 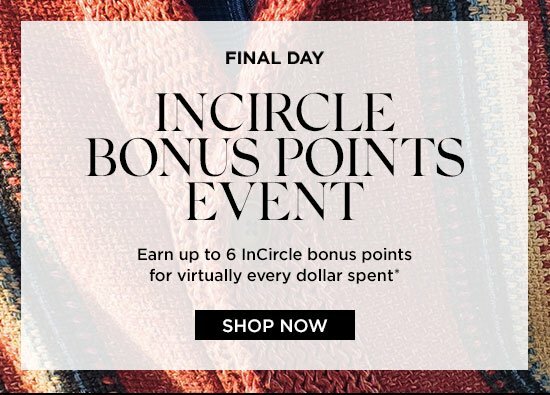 InCircle® bonus points can be earned using your NM or BG credit card at BG stores or bg.com only from April 10 - 14, 2019. Your account must be in good standing and at current point level for 30 days to be eligible for redemption. InCircle® bonus points are earned on net purchases (minus any credits or returns). InCircle® bonus points cannot be earned on prior purchases, sales tax, or shipping, alterations, beauty salons, or BG gift cards. Promotional financing plan purchases may not be eligible for InCircle® bonus points. Any InCircle® offer that awards bonus points may not be combined with any other InCircle® bonus point offers. InCircle® bonus points will be awarded to the account used within six weeks from date of order. Enrolled Platinum Card® and Centurion® members from American Express are not eligible for InCircle® bonus points opportunities. Neiman Marcus Group employees are not eligible for this offer. Offer not valid on prior purchases/promotion does not apply to prior purchases. Bergdorf Goodman reserves the right to change or cancel this promotion at any time. Visit incircle.com to learn how to become an InCircle® member.